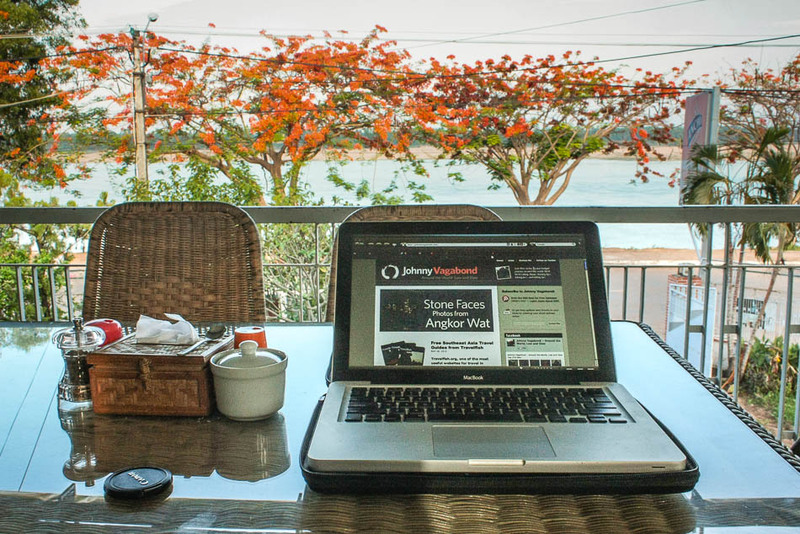 It’s a bit of an over-used term these days but I’ve yet to find one that better fits my lifestyle: I am a digital nomad. I move about the world, needing only power, wifi and my laptop to make a meager living. And because I carry everything on my back, not only price becomes a consideration for new gear, but weight and space as well. For anyone using a Macbook Air or Retina, the flash-based storage is fast but very limiting, compared to 2-3TB hard drives. 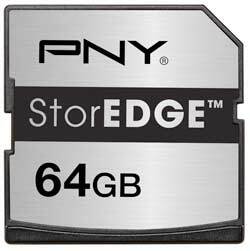 If you’re struggling with 128GB on your Air, consider adding another 50% of capacity with the PNY StorEDGE 64GB Flash Memory Expansion Module . It slides into your SD card reader and –while not terribly fast– is quick enough to offload your photos and music from your main drive. I keep 40-50GB of photos on mine so I don’t have to mount my external drive (and waste time digging for it in my pack). When you’re ready to import images from your camera, simply unmount the drive and pull it from the slot — fingernails really help here as it only protrudes about 1/8″ from the case. It’s a lot of added capacity for only $40. I opened up a pouch of Sugru Air-Curing Rubber , kneaded it like epoxy for a moment and then created a rubber support for the weak spot. To make it even more sturdy, I used the rest of the compound to weld the thin cable to the main power cable, and let it sit overnight, relieving any and all stress on the weak spot. It isn’t pretty or graceful but it seems to work. Sugru comes in several colors and has a ton of uses. I always carry a packet or two, just in case. Weighs nothing and is fairly cheap. This thing has saved me so many times. 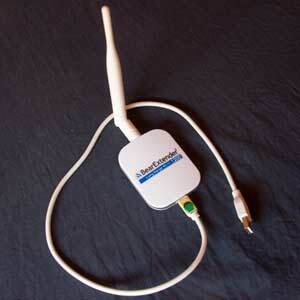 I’m using the Mac-based BearExtender USB WiFi Signal Booster Antenna and there are many more PC-based products available as well. If my hotel wifi goes down, I simply plug in my extender and can connect to twice as many nodes in the area as before. Which means I can mooch off that cafe down the street where I had breakfast while I wait for the hotel network to come back up. This is actually a marriage of two different products. I’ve used an UltraPod Tripod for years and though it’s not strong enough for a SLR, it is plenty capable of holding a Point-and-Shoot camera steady. And it has a velcro strap that allows you to use a fence post for support. All for less than $15 and weighing in at a whopping two ounces. Now, combine the UltraPod with the Jellyfish Smartphone Spring Tripod Mount and you have a fully-functional tripod that costs you less than $30 and weighs less than three ounces in total. And it folds up into a very tiny package. USB cables, whether in black or in white, can be a pain to deal with. In low light or possibly when distracted, figuring out which side is “up” can be a pain. And when you have to set up, then break down several times a day, the frustration builds up. Get rid of that nuisance by marking your cables — I started with a Sharpie “x” on the ‘up’ side but found that it faded too quickly. 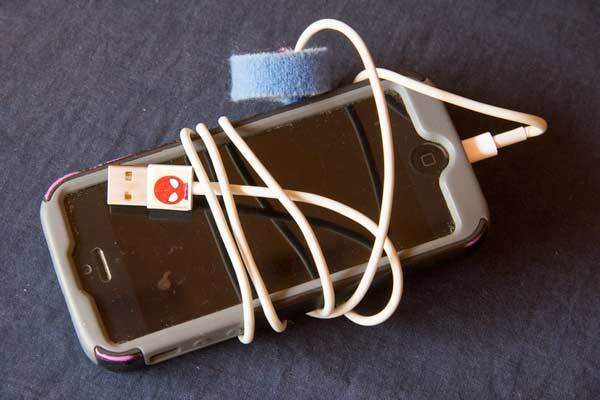 And it didn’t work for black cords. Those silver ink art pens from Hobby Lobby would work (or you might steal one from your niece or nephew if she/he’s in the right age bracket). I found the local 7-11′s here in Thailand handing out tiny stickers as part of some contest and they were just the right size for all of my cords. Spider Man face up? Good to go. It only saves seconds each time but if you add those seconds up over the course of a year, you’ve got time for a nice nap. Go ahead: you’ve earned it. The SD card idea is brilliant. I haven’t been paying attention to flash drive prices or sizes but now I see they’ve gotten to the point where you really can use them as back-up devices. I have a 128MB flash drive in my laptop, I shoot photos in raw, and am always needing to move photos off my computer to a 2TB external drive I carry. The problem is, that the external drive isn’t back-up, it’s primary storage. I think what I’ll do now, thanks to you, is buy a 64 or 128 MB SD card and use that to back-up my “must have” photos. Thanks for the tip. As far as slimming down, have you looked into the mirrorless cameras? I just traded my DSLR in for one and am quite pleased with the performance and the weight of my gear. OMG I HAVE to buy Sugru! I can’t tell you how many times I could have used that. That Sugru looks like amazing stuff! Can’t tell you how many power supplies I’ve gone through in the past few years… thanks! Great post! 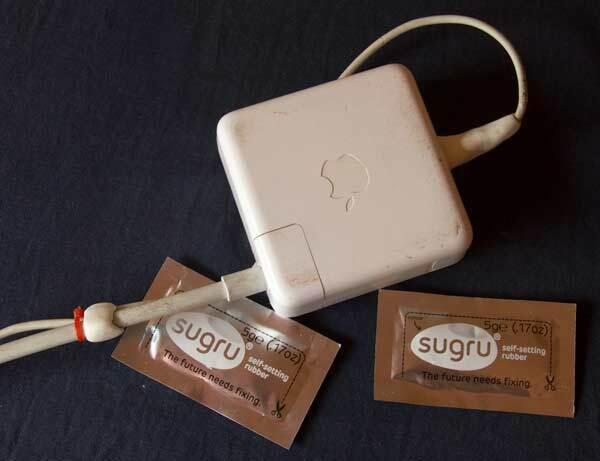 WOW how Have I not heard of sugru!? my macbook cord is on it’s last leg. hopefully amazon can send this to India! That Sugru is going to come in handy in countering certain recent cat-fang-related difficulties of mine…thanks for the tip. I just bought a Mophie juice pack, which has almost doubled the battery life on my iPhone5. It’s fantastic and I leave it attached to my phone all the time. It just looks like a case. Thanks — I’ll check that out, as my phone is really starting to make me crazy with the battery performance. 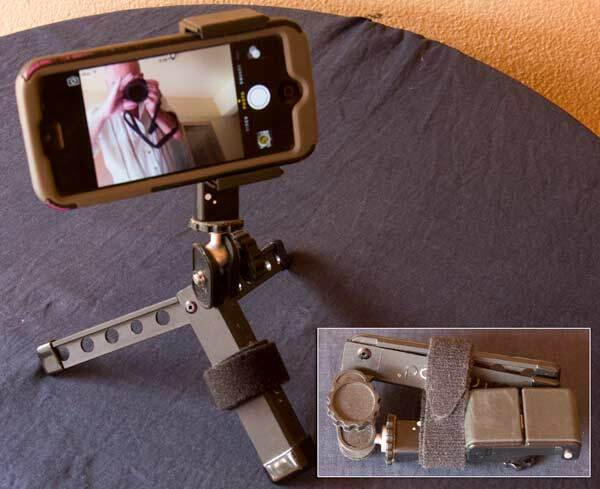 A Glif+ tripod also works a charm if your seeking a mount solution for an iPhone. Slugru works a charm, over time its a small investment to make. Ha, wicked tips mate. As funny as that rubber stuff looks in the packaging its genius! I’ve gone through so many charges because of this!